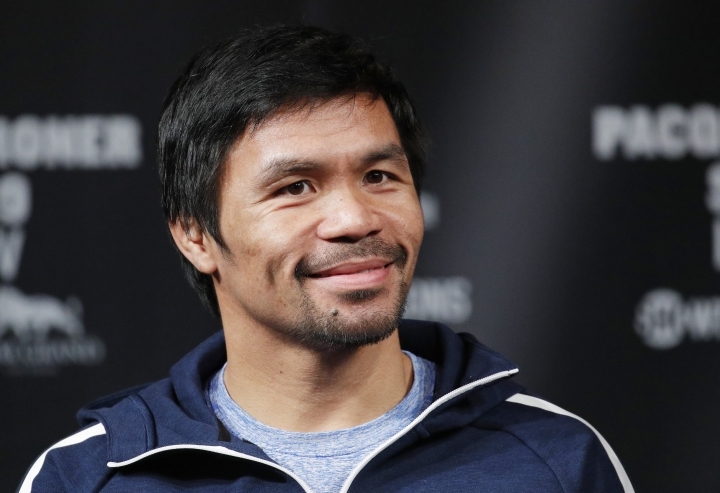 LAS VEGAS — Manny Pacquiao has been beating the odds since he was a teenager in the Philippines stuffing his pockets with metal at weigh-ins so he wouldn't look like a 98-pound weakling. Nearly a quarter century later, Pacquiao is still up for a challenge. He fights Saturday night against Adrien Broner in a true crossroads bout that will determine a lot about his future in the ring. Chasing a second fight with Floyd Mayweather, Pacquiao will be tested by a younger and talented fighter who has a lot to prove himself. He's 40 now, an age where fighters either have long stopped lacing up the gloves or are very careful in picking opponents. Pacquiao is not only still fighting, but willing to take on a 29-year-old who thinks of himself as a young Mayweather. And he's not terribly concerned about the possibility he might lose. 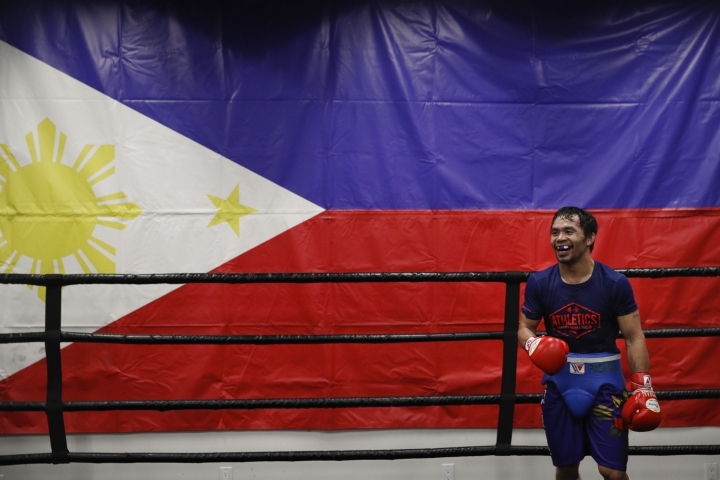 "I still have that killer instinct and the fire in my eyes is still there," Pacquiao said. "That aggressiveness, the interest in this career is still there 100 percent. The speed and the power are still there." 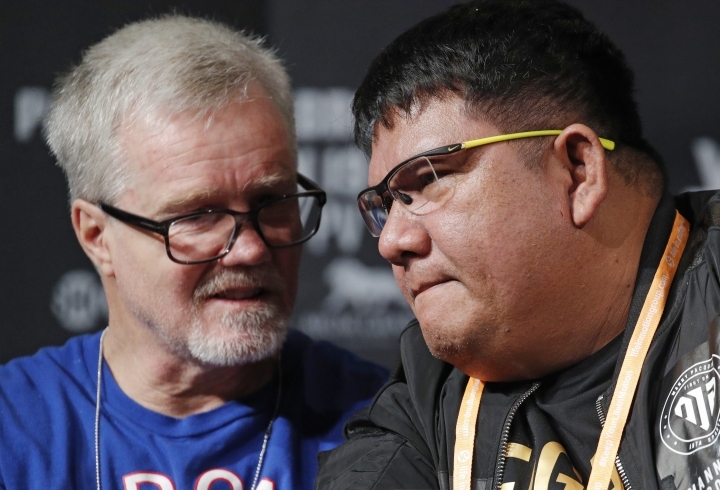 That showed in a gym session this week in Hollywood, where Pacquiao looked sharp and fast while hitting the mitts with trainer Freddie Roach. The two have reunited for the fight, Pacquiao's first in the U.S. in more than two years. But while Pacquiao is favored, there's always a chance in boxing that age often catches up to a fighter in the wrong place — the ring. And that adds some intrigue to seeing a fighter who has been so much of a part of the fabric of boxing for the last 15 years. "He's unbelievable," Roach said. "His work ethic is great, he has fast hands and he still hits hard. I think he actually wants to knock this opponent out." That may be asking a lot since Pacquiao went nearly a decade without knocking anyone out before stopping Lucas Martin Matthysse in a fight in Malaysia last July. But if Pacquiao needed any more motivation he got it after Broner mocked the Parkinson's that Roach has. "Manny's a great guy to have on your side," Roach said. 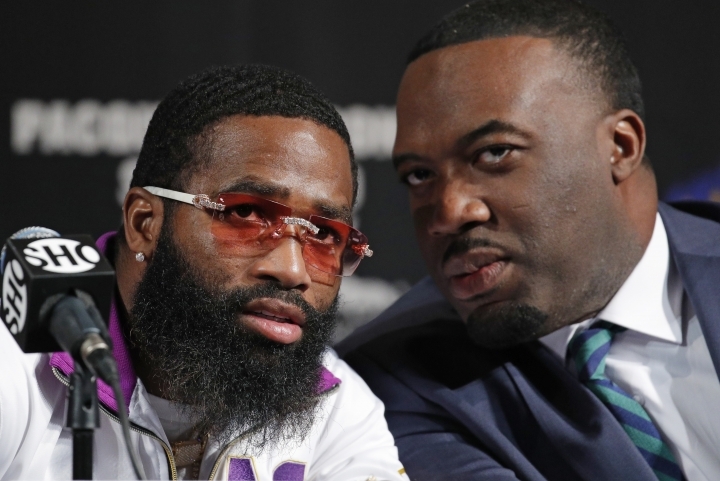 Indeed, Broner has done his part to sell the fight by acting boorish and flashing money around like his mentor, Mayweather. 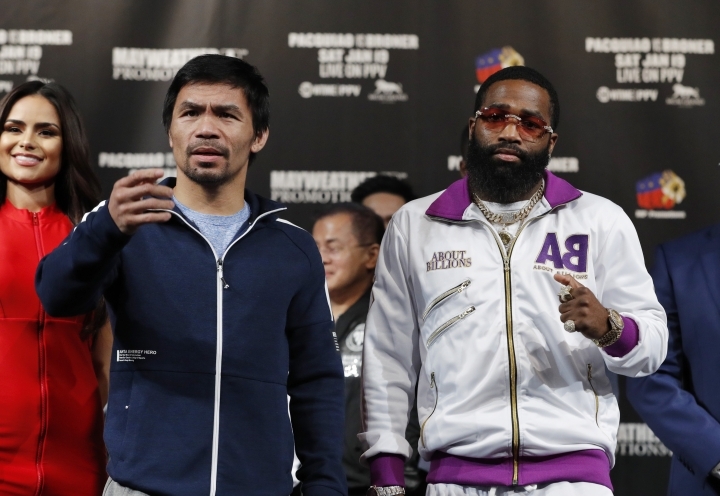 At this week's final news conference, Broner went into a profane rant about Showtime announcer Al Bernstein, though his comments about Pacquiao were more respectful. "Pacquiao's a legend," Broner said. "He'll always go down as one of the best in the boxing business. But I just feel like it's my time to take over this sport and I'm coming to take the throne from Pacquiao." Broner (33-3-1, 24 knockouts) certainly has the skills to do just that. He has long been considered an elite fighter, though he has lost most of his bigger fights and tends to be undisciplined in the ring. To beat Pacquiao he will have to use his speed to match that of the Filipino senator, and figure out a way to deal with an unorthodox style that has puzzled opponents since Pacquiao began fighting for $2 purses so he could help his mother feed the family. "Adrien Broner is not a tuneup fight," Pacquiao said. "He's a former champion. He's fast, he moves fast and he's a good boxer." Unfortunately, a lot of fans won't be watching. The fight is on Showtime pay-per-view and the price ($74.95) is lofty for a fighter a few years removed from his prime. Still, Pacquiao will make millions, and Broner will have a big payday of his own. 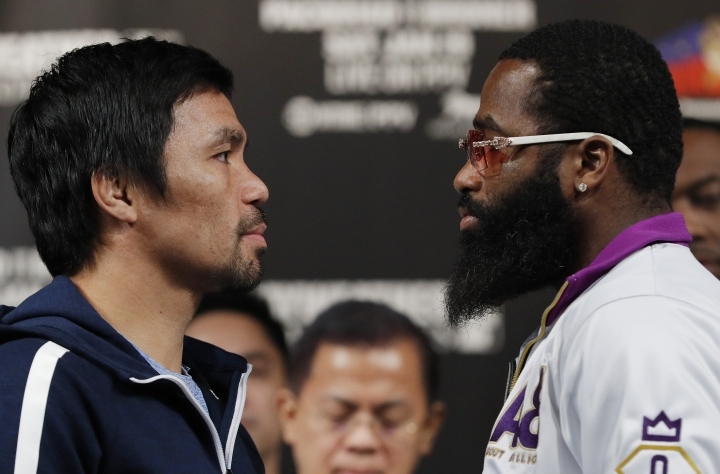 Both would also profit with a win, with Broner regaining some of his reputation and Pacquiao putting himself in line for another possible huge payday against Mayweather, who still says he is officially retired. Pacquiao blamed an injured shoulder for his poor performance in the 2015 bout, a lackluster affair won by Mayweather. A second Mayweather fight would cap Pacquiao's career and put him closer to retirement and full-time duties in the Senate in his home country. It's on Pacquiao's mind, as well as the mind of his millions of fans. "You cannot avoid people will ask if there's a rematch with Floyd Mayweather," Pacquiao said, "because I think they have a big question mark in their mind and also in their heart about what happened in that fight."